He-man Phaon impresses Sappho of Lesbos at the temple of Aphrodite, circa 600 B.C. In a remote Californian desert town, a lawyer arranges for a wanted mobster to skip the country via a small airstrip but the local sheriff and his deputy could pose a problem. An American army unit is trapped in a small town during a German counterattack and discovers that a spy in the town is providing the Germans with information about them. Actis: You seem dazed by his words. Sappho: What are you saying, Actis? Actis: I'm ashamed of you. Don't you understand? You must never trust them. Never. Men bring only deceit, hatred and lies. Sappho: They must have made you suffer very much. Actis: I hate them! They dazzle you with their insolent glances. You don't know them. But, as long as I'm alive, they'll never harm you. You're the only dear friend I'll ever have, Sappho. When HERCULES, starring Steve Reeves and directed by Pietro Francisci, became a phenomenon, a dizzying number of Sword & Sandal (also known as Peplum) films soon followed. Nearly 300 such films were made between 1958 and the mid-1960s thanks to the success of HERCULES. It's one of the most unique film trends ever seen in cinematic history. Not even STAR WARS generated so many films after its massive success. The Peplum genre was diversified and many sub-genres proliferated, such as Peplum/Comedies, Peplum/Sci-fi, Peplum/Historical and most notably the Peplum/Romance sub-genre. Most Peplum films were made with kids or male viewers in mind but female viewers were actually quite important for the success of the genre and it was only logical that S&S films specifically made for female audiences were also produced. And this film is part of that Peplum/Romance sub-genre. Known as THE WARRIOR EMPRESS in the US, which doesn't make any sense. There is no Empress in the movie and even less a Warrior Empress. The original Italian title translates to SAPPHO, VENUS OF LESBOS, which is what I'll use for this review. SAPPHO, VENUS OF LESBOS is one satisfying S&S film. Directed also by Pietro Francisci, SAPPHO is fast, kitschy fun and dreamy. I'm memorized by it. After I initially saw it, I watched it once a day 4 days in a row. Regardless of the fact that there are no bare-chested men in it (which is THE main ingredient for a Peplum) SAPPHO hits all the right Peplum notes. 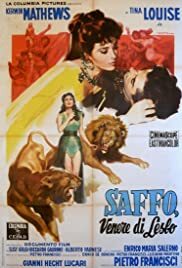 Even if it's a romantic film filled with the usual conflicts of two men fighting over Sappho, it still has a lot of sword fights, chariot race, an impressive big battle, ramming ships and, of course, killer lions, all set to a great swirling score. Take the beginning, for example, which I find brilliant. The set-up is amazing: the first 10 minutes has minimal dialogue, mainly music and sound. It introduces the characters in action and creates a wonderful world that swept you up and never lets go till the end of the film. The direction is mesmerizing. All the main actors give their all. Tina Louise is perfect as Sappho, "the world's boldest beauty", as the film's tag-line says. The handsome Kerwin Mathews (who died last year, RIP) gives a thoughtful energetic performance. Kerwin was definitely an overlooked actor. But best of all is the uniquely dashing Riccardo Garrone as Hyperbius, who almost steals the film from the American actors. Garrone gives a forceful performance that could have easily fallen into caricature but here he's totally believable. In contrast, the actor who plays the King is a caricature and is one of the weak notes in the film. Susy Andersen (credited as Susy Golgi), the actress who plays Actis, Sappho's close friend, is a stunning beauty. What happens to her character is one of the most pivotal moments. This film has the best named cast of characters ever: Sappho, Phaon, Hyperbius, Actis, Laricus, Melanchrus, etc. The soldiers' costumes are some of the coolest ever designed. Dark and detailed, with impressive Rooster-like helmets and short skirt line which accentuates, if anything else, the men's legs. And the girls' unique blue & black "nightgowns" are fetching even if they're probably not historically accurate. The score by Angelo Francesco Lavagnino is truly a thing of beauty. Lavagnino is, like so many who worked in the Peplum genre, underrated, to say the least. By now this film is totally forgotten. Heck, this will be the first review here at IMDb. And it's a shame because it's great fun and near perfect Peplum kitsch!